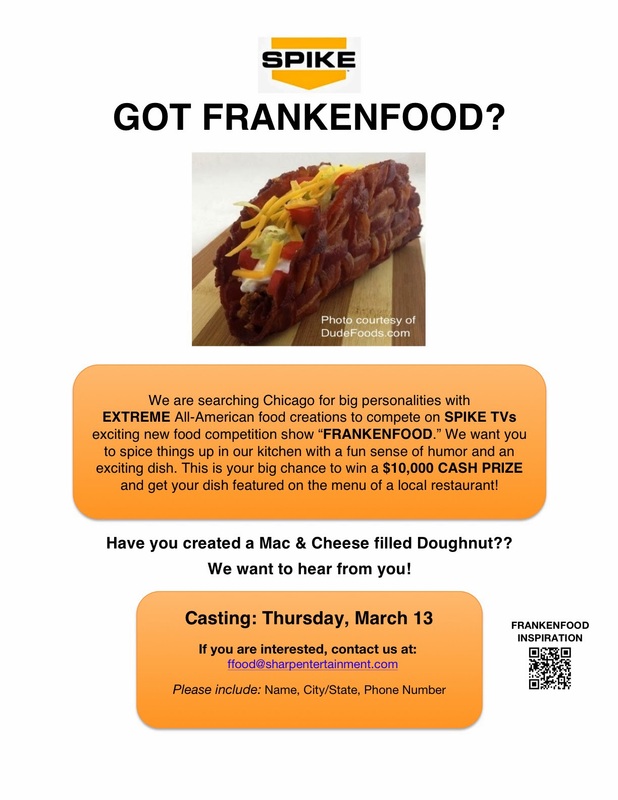 "FRANKENFOOD" is casting in Chicago. Think American Idol meets Iron Chef. You can compete to win $10,000 AND have your crazy dish put on a local restaurant’s menu. The casting competition takes place on Thursday, March 13 in the Chicago area - location and time to be determined. They want you to attend. This event is going to be a lot of fun. . Here's what you'll have to do. Create a dish made up of All-American ingredients that would not normally be paired but somehow once stitched together, makes sense... AND tastes great (or at least tastes great to you). Examples: Mac & Cheese filled doughnut, Blueberry pancake wrapped sausage (with maple syrup filling on a stick), Grilled cheese Chocolate-chip cookie. If have any questions, please feel free to call me at 212.784.7770 x 437 or email at ffood@sharpentertainment.com. You do not have to be a professional chef to enter.